Avios.com and The Economist have brought back their special offer for taking out a subscription. As you can see at this link, you can earn 13,200 Avios if you take out a 1-year digital and print subscription to The Economist. The cost is £179. This works out at 1.35p per Avios. This offer is particularly attractive if you are self-employed or run a company. Whilst I am not a tax expert and you should obviously take your own advice if necessary, it would be hard to argue that The Economist magazine is not an acceptable tax-deductible purchase for most business people. The Economist changed the rules of this promotion two years ago after a large number of people took out a subscription and then cancelled it for a partial refund a few weeks later. Your subscription is now non-refundable. However, £179 for 13,200 Avios plus a full year of The Economist in print and online is certainly not a bad deal. If you have any friends in the United States who may enjoy The Economist in print (you could access the digital version yourself), there is a bigger deal to be had. The cost is $190 (£142) for 13,200 Avios. Note also that the DIGITAL ONLY version for US residents is $152 (£117) and you get 10,200 Avios for yourself. The offer runs until 31st January 2018. PS. There is a similar version for 11,400 Miles & More miles (8,700 with the cheaper package) – see here. This is not a bad deal at all, given how tricky it is to accumulate Miles & More miles in the UK. Heathrow Rewards is adding a new airline partner today – Royal Brunei. You will be able to transfer your Heathrow Rewards points (available from airport shopping, parking or Heathrow Express tickets) into Royal Brunei Royal Skies miles at the rate of 1:1, in chunks of 250. It joins a list of airline transfer partners that includes Avios, Virgin Atlantic, Lufthansa, Emirates, Etihad and Singapore Airlines. 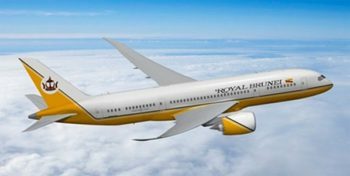 If you transfer your points to Royal Brunei during December, you will be entered into a competition to win a pair of return flights from Heathrow to Dubai with Royal Brunei. If you have ever used the Regus Express business lounges in Heathrow Terminal 5 Arrivals, Heathrow Terminal 2 or at Gatwick, you will be pleased to know that a Regus Express is opening in Heathrow Terminal 3 very soon. This could be used as a departure lounge because it is quite well positioned. It is situated by Pret a Manger which is UP the escalator from the check-in hall. Regular users of Terminal 3 will know that you turn left at the top of the escalator to get to security. The Regus Express is on the right, tucked away around the corner. The problem with using this before a flight is, of course, that you still need to clear security and will need to very aware of the cut-off time. It will be an option for anyone who is at the airport a couple of hours early and would prefer to do an hour of work in the Regus lounge before going airside. You will be able to get access with a Regus Gold card or with a DragonPass airport lounge access pass. I imagine that you can also pay, but if you were planning to do that it would be preferable to clear security and pay for the No 1 Lounge (review) or Club Aspire (review) lounges in Terminal 3 instead. Regus lounges are not part of Priority Pass or Lounge Club. Avios Ireland: Triple Avios in AerClub with SuperValu! This offer isn’t for BA Executive members is it? The link from my BA exec club page goes to an offer that gives just 3400 points for the print only deal not 10200 points. Anyone know if I can move my BA points into avios and if so whether that’s a good idea? Yes. Use Combine my avios on BA / avios.com (separate portals, same currency). On the off chance this of use to anyone, there’s a pair of F seats on CX CDG-HKG 6th Feb on BA’s website. Only mentioning it because two have rarely come up in my searches. 140,000 avios + 119GBP p.p. Caution on the Economist deal. I subscribed back in October and clicked through to the deal from the Avios.com website, I clearly wasn’t paying too much attention at the time else I’d have spotted this, but anyhow thought I’d signed up to the 13,000 triple offer. Subsequently only 4400 have been posted. I sent an email to the Economist asking for the missing avios to be posted, they asked me to send them my confirmation email, which only says 4,400 in it. It turns out the the link to the deal from the avios.com website doesn’t take you to the same place as the link in this HfP article! Avios.com takes you to https://subscription.economist.com/OA/partners/AviosBase/Base instead of https://subscription.economist.com/OA/partners/Avios/Trpl despite it saying click here for 13,200 points! I suspect the same thing happen to me in October. Will follow up with Avios, but I’m not overly hopeful.